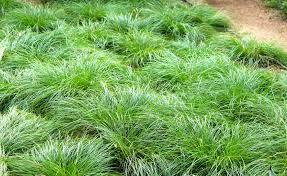 Texas sedge, Carex texensis, is a heat-tolerant grassy perennial that grows well in both suns or partial shade. The yellow-green leaves are fine-textured, and small white flowers appear in summer. Native to North America, it grows in clumps without spreading and attains a height of around ten inches. Although moist, well-drained soil is ideal, Texas sedge is drought-resistant and adapts to many types of land. It is useful as a ground cover or an accent plant. Colonizing through rhizomes, it is an acceptable lawn-alternative, requiring infrequent mowing. 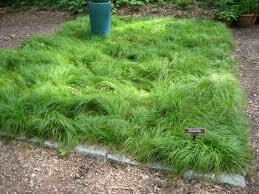 In garden settings, Texas sedge can be cut down in winter before new growth begins. This fast-growing plant has no significant pests. If you are looking for a fun, attractive and practical replacement for grass Texas Sedge is precisely what you are seeking. Though native to the eastern, central and southern United States Texas Sedge gets its name from its dominant growth location in Central Texas, which can be hot and dry. This foliage is low maintenance and thrives in drought conditions. Yellow-green in color and fine and tufty in appearance, this plant does not have to be mowed very often. When Texas Sedge gets too high, you can turn your mower on high and directly reach the job done. This plant grows in clumps so you can cover as much or as little ground as you'd like without worrying about spreading. There The ideal soil would be dry or slightly wet, making this great for the environment and a way to save on your water bill. Texas Sedge is not very picky when it comes to soil. The best growth environment would be a moist well-drained sandy soil, but it is adaptable to many different kinds of land. This plant does well with light foot traffic and will look fabulous planted alongside your footpath or interspersed with bulbs and other flowers. Grass can be very time-consuming, needing the perfect conditions, and a lot of maintenance and that is why so many people are replacing it with Texas Sedge which takes up less of your time and looks terrific. Texas Sedge is great to plant Texas Sedge under live trees for groundcover; it can also be used for naturalization and landscape restoration in sandy areas.